A Fine Line, developed by True North/Carnegie Mellon University's Entertainment Technology Center (ETC), has won gold honors in the 2016 International Serious Play Awards competition under the Student Higher Education category. 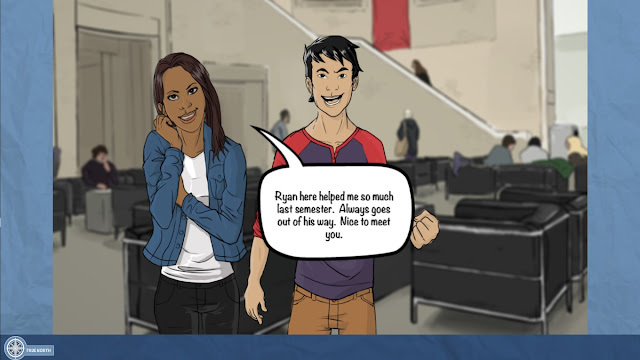 The Serious Game addresses academic integrity and violations, on and beyond campus life. In partnership with students and administrators on main campus, the ETC student developers aimed to create a tool for the university to educate and speak to both the practical and moral implications of academic integrity. 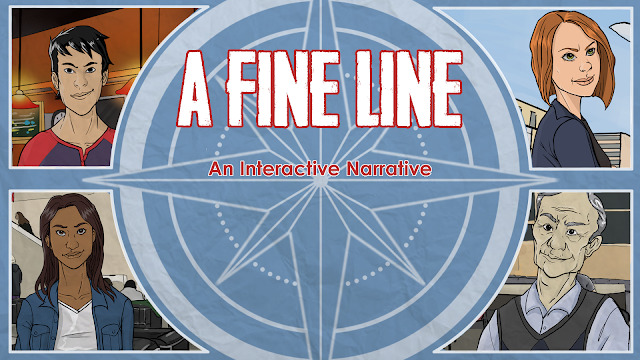 Presented in the form of a web-based, illustrated world, the experience gives players the ability to navigate the story, and make impactful decisions within it. 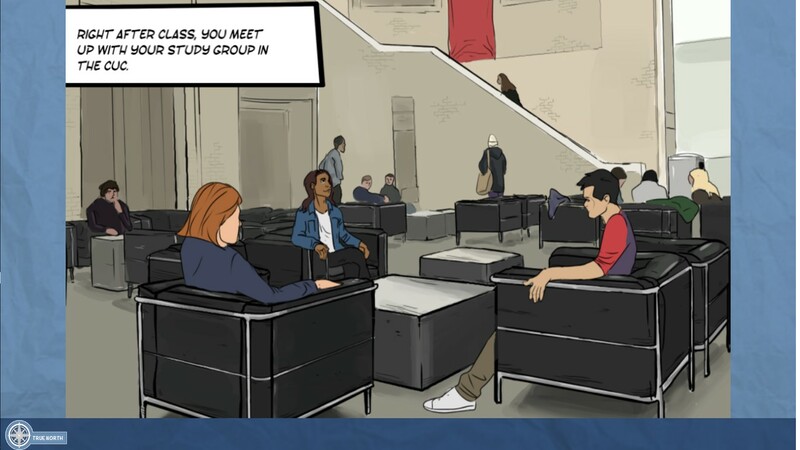 It creates an environment where students confront true-to-life scenarios involving academic integrity, and reflect on how they would navigate these challenges in real life. 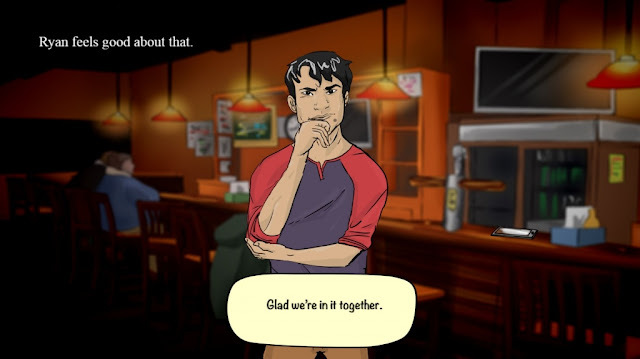 In the game, you play a student who along with three friends must navigate your last semester in school, balancing demanding coursework with your relationships. 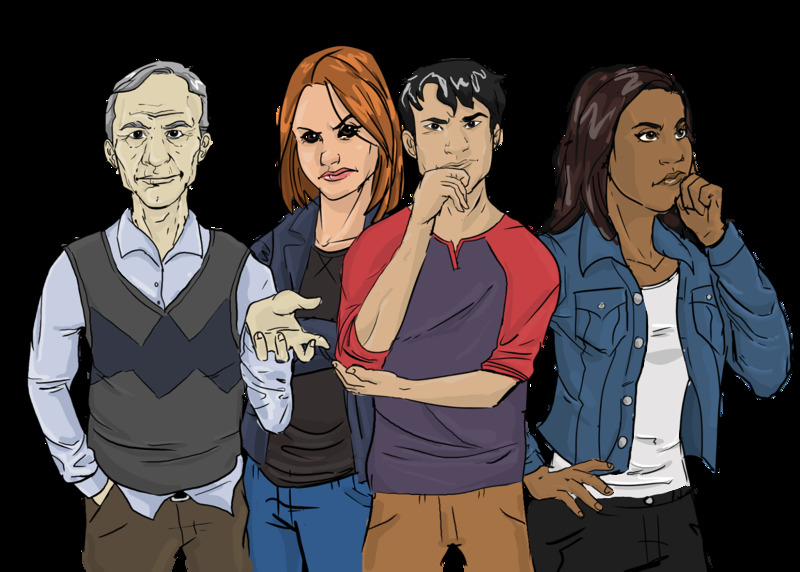 The characters within the story are based on composite case studies. They incorporate and explore the psychological motivations that encourage people to commit academic violations. Through combining story elements, expressive characters, and player interaction, ETC students aim to promote behavioral change. Their goal was to develop a complex and engaging experience for players where they must learn and reflect on their own perceptions of what integrity means, especially as they move on to the professional world. Sarabeth Boak (Co-Producer, Writer), Ross Houston (Artist), Timothy Staton-Davis, (Co-Producer, Game Designer) and Emily Zhou (Programmer, Sound Designer). Faculty instructors were Mike Christel & Ralph Vituccio, both from the Entertainment Technology Center. Project clients include Lucas Christain (Director of Community Standards & Integrity) and Joanna Dickert (Assistant Director of Undergraduate Research and National Fellowships), both from Carnegie Mellon University, and also Carnegie Mellon University Academic Integrity Resources. In May the team concluded the 15 week production. They presented the project to the ETC faculty, as well as to faculty and administrators on main campus. The response on campus was reportedly exciting, and they were coordinating with their client to pilot the experience in the context of a summer course.